Why sell tickets at OnStage Direct? Sell tickets online for events with arranged or open seating. Arranged seating is for Theatre seating (rows and seats), Cabaret (tables and chairs) and Arena (Ice shows). Sell tickets at the office, at no charge. Sellers can print out tickets, apply discounts, box office fees and enter reservation notes for ticket orders. 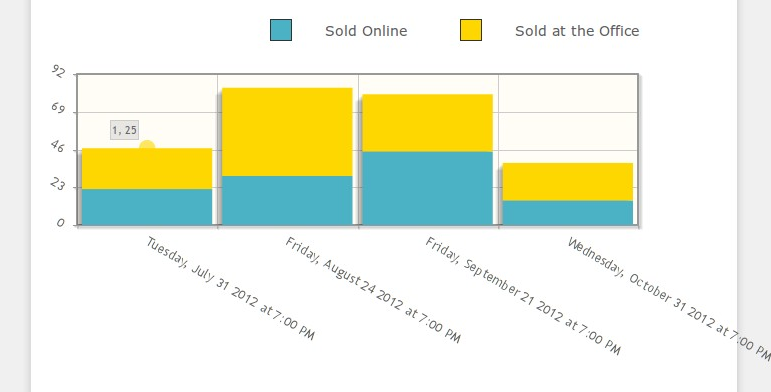 View detailed real-time sales statistics, reports and lists of buyers for current and past events. Door tickets: print out sheets of tickets for selling at the door. For arrange seating, print door tickets for available seats. Fast payment: on the next business day after the event. Sell tickets for public and private events. Set different ticket prices depending on seats (rows or tables) and age of audience (adults, children, seniors, students, participants). Offer Promotion Codes, Personal Promotion Codes, Promotion Rules (Buy One, Get One...) and Group Discounts to your customers. Exceptional customer service and support: we answer ALL questions from both sellers and buyers within the same day, and more often, within the same hour. Our clients like this service and recommend it to others. Read their testimonials. Why buy tickets here ? Buyers view the current seating plan state and select the seats they prefer. Lowest convenience fees for buyers satisfaction. No hidden fees: buyers see the convenience fees as soon as they choose their seats. No other fees are added during checkout process. We provide full time customer support. Printing your logo on tickets (optional) $39.99 per year. No hidden fees, no other fees.